With rising sea levels, higher carbon dioxide levels and plastic bottles glutting landfills and oceans, the issue of sustainability has become a hot topic. Hotels and resorts have started to act by ramping up efforts to reduce or eliminate completely their resource and energy consumption. While Marriott International and other large chains have promised to eliminate items that never fully decompose, like plastic straws, there is still a lot more work to be done. “There are thousands of these one-at-a-time initiatives, but these are not evenly spread across the lodging industry,” said Bjorn Hanson, a clinical professor at New York University’s Tisch Center for Hospitality and Tourism. Here are four ways that hotels and resorts are addressing climate concerns and contributing to Earth Day awareness. The 114-room Conrad Bora Bora Nui resort in French Polynesia has developed 17 different underwater coral structures around its resort with the mindset to regenerate them. This is done using a “Biorock” technique (passing a low-voltage current through electrodes in the water) developed by the marine biologist Denis Schneider. The process is currently considered among the best ways to fight coral mortality. Sebastien Pisano, the hotel’s general manager, said that he has seen a significant increase in the amount of coral around the resort, and this now spans a half acre (roughly the size of three tennis courts). “Coral feeds plankton and plankton feeds fish, so there’s an entire ecosystem,” he said. Guests of the resort can take part in a free snorkeling coral reef experience. The Mayakoba region in Riviera Maya, Mexico, is filled with lagoons and mangroves, and one luxury property there attempts to offer ecotourism experiences to guests. Fairmont Mayakoba, in alliance with a nongovernmental organization called Oceanus A.C., arranges a snorkel tour for $9 per person to underwater nurseries near the Puerto Morales national park area, where guests gather acropora palmata (a type of Caribbean reef-building coral) detached by the force of the marine current. With assistance of the tour leader, they help transplant the coral to the sea bottom to ensure it is able to continue its growth. Some properties creatively tap into their natural resources. 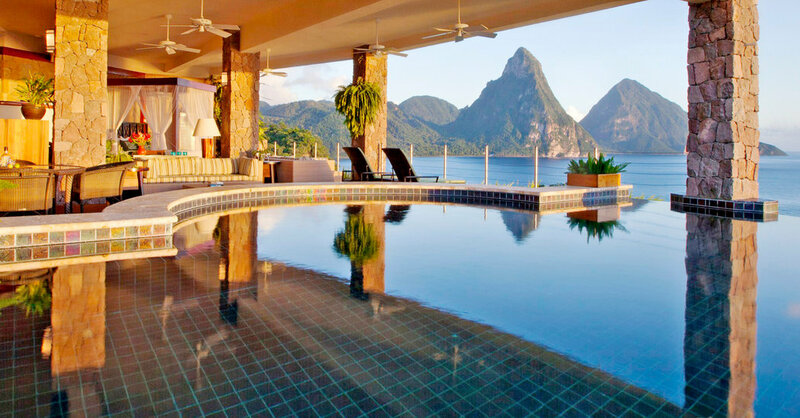 All of the water drunk and used at Jade Mountain in St. Lucia draws from a river in the Anse Mamim valley; the resort filters and conditions it in a treatment facility. The resort also designed open-air rooms to allow natural breezes to cool the areas, eliminating the need for air-conditioning. “We are still able to maintain our luxury experience,” said Carl Hunter, the resort’s property manager, adding that the potable water takes care of all the hotel’s needs. Solmar Hotels and Resorts in Cabo San Lucas, Mexico, heats water (including in its pools) using photo-thermal panels. “We have close to 1,000 rooms and this renewable energy source produces a gas-less heat,” said Ricardo Orozco, vice president of operations. He said that this energy savings translates into fewer emissions into the atmosphere (or the equivalent of pulling 198 gasoline-run cars out of circulation). Hostelling International USA became the first hostel company in the world to implement “smart showers” that limits showering time to seven minutes. The company plans to roll out more than 750 showers across its 50 properties, each with colorful LED lights to gently alert guests that time’s up. “If each guest showers for 30 seconds less, we save around one million gallons of water each year,” said Netanya Trimboli, the Hostelling International’s marketing director. Kudadoo, a private resort island in the Maldives, became the first fully energy-sustainable property there, using solar panels designed into the roof of its main building, The Retreat. This energy source is able to fully power the island. The 99-room Svart, on the Helgeland coastline in Norway, will open by 2022 as the world’s first net energy positive hotel above the polar circle. The entire hotel is powered by solar panels; excess energy is saved for when the country has more darkness than light-filled days. “We have also removed materials that consume more energy, including concrete, and focused on wood, natural stone or glass,” said Ivaylo Lefterov, the project manager. With roughly a third of the world’s food getting either lost or wasted, more hotels and resorts have begun efforts to curb squandering on their properties. The Spectator Hotel in Charleston, S.C., recently established a food waste diversion program where half-eaten food items such as fruit and pastries are put into a digester that turns them into reusable water. “From the program’s initial launch in August 2018, the hotel has diverted over 11,234.5 pounds of food waste from landfill while creating 944 gallons of water,” said the general manager Carlo Carroccia. The Inn at Dos Brisas in Washington, Tx., won an industry award for its efforts in environmental sustainability, for composting the waste products of the inn’s equestrian facility on a large scale and reviving the once-depleted land. Combined with tree branches, this creates an organic fertilizer later sold at farmers’ markets. Two Arlo hotels in New York City currently offer free monthly talks about sustainability, across various industries, with the aim of forming a community for eco-conscious travelers. The next one in SoHo on May 15 explains wild harvesting, ethnobotany and how to lead a green lifestyle. The Palms Hotel & Spa in Miami Beach organizes three-hour-long beach cleanups every three months. Guests can register on this site and are encouraged to bring their own water in reusable containers; cleanups for 2019 occur on April 20, Sept. 14 and Nov. 16.